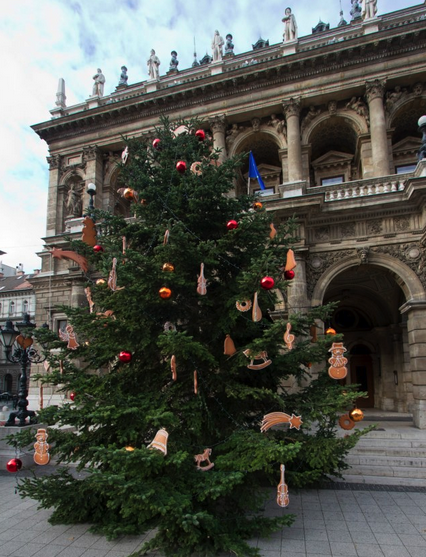 One of the characteristic Budapest Christmas Sights every winter is the Andrassy Avenue itself, one of the UNESCO World Heritage sites in Budapest, Hungary (along with the Buda Castle and the Danube riverfront). The Christmas lights in the city of Budapest are usually lit up from December 1 every year, as part of the Budapest Christmas ceremony opened by the mayor of the capital city of Hungary. Of course, as all public places, Andrassy avenue is open all year round (occasionally taken up by promenades and festivals, or the trumpets and parties of New Year’s Eve in Budapest). 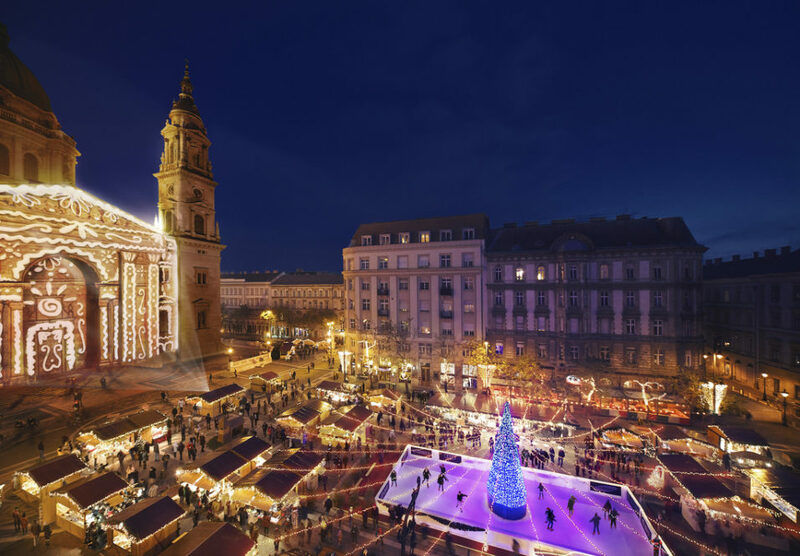 The more festive and richer section of Andrassy Ave starts from Elisabeth Square (almost from Deak Square where all 3 metro lines meet) and keeps going until Oktogon square, where the Avenue meets the big ring road aka the Grand Boulevard of Budapest. Then the avenue goes straight ahead until it reaches the spacious grandeur of the Millennium Monument on Heroes Square by the City Park of Budapest. 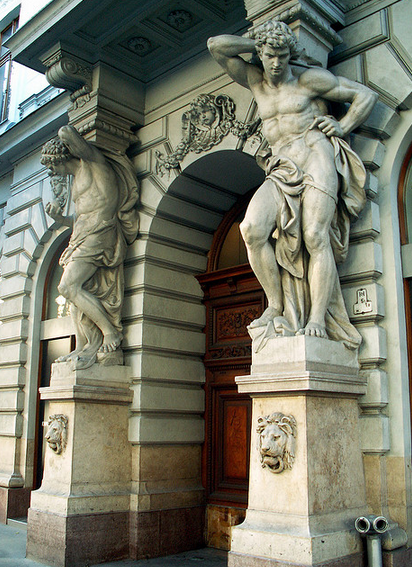 There are many Budapest attractions along the beautiful Andrasy Avenue, which makes a nice walk in wintry Budapest. 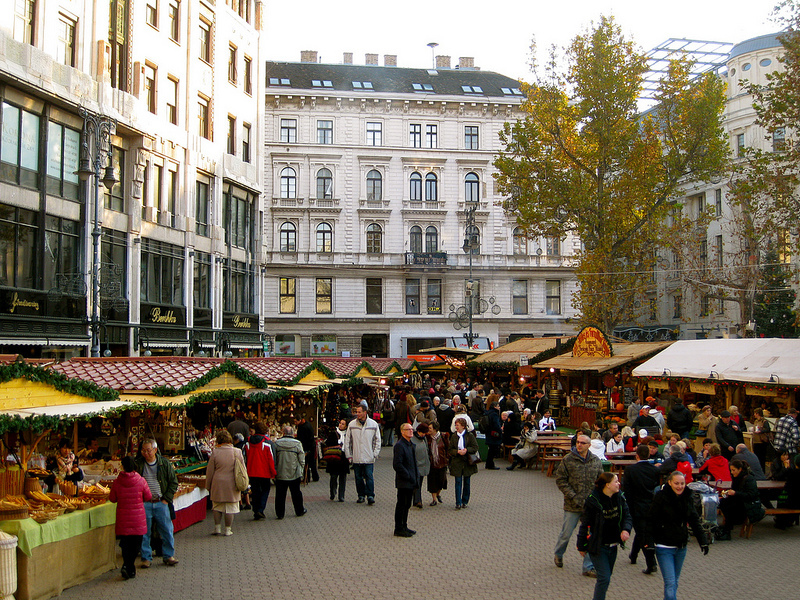 Do get dressed well, warm shoes / boots and a good thick coat is ideal for walking in winter in Budapest. You can see the Opera House, the Paris Department Store with its fantastic lush Cafe, the House of Terror Museum, the Lukacs Confectionery (one of the best Budapest confectioneries), Drechsler House (a fascinating palace, formerly the Hungarian Postal Museum), the Academy of Music on Liszt Ferenc Square (along with dozens of restaurants and cafes), further ahead by Kodaly korond Square, the Franz Liszt Memorial House and the old Academy of Music, Zoltan Kodaly Memorial House, Ferenc Hopp East-Asian Art Museum, etc. There are several luxury boutiques on Andrassy Ave, which offers a good way to take a look at a bit of Christmas window shopping too (mostly minimalist Xmas decor design). 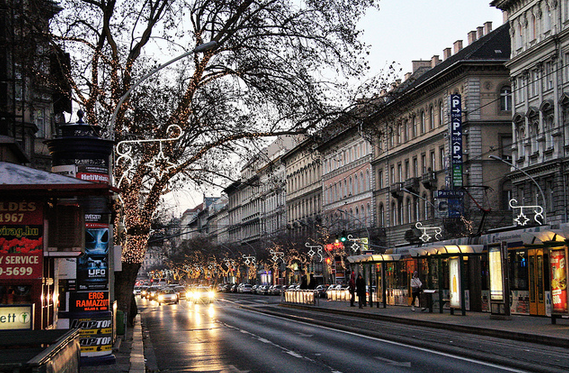 Many of the luxury shops opened in 2011 in Budapest on the luxury road of Andrassy Avenue. Hublot boutique on Andrassy offer Swiss luxury watches and ‘horology’, anything to do with keeping track of time, our most valuable luxury, and the most limited by its nature. Breitling is coming soon too. Madison Perfumery and Beauty Salon on Andrássy út: to buy a Chanel No 5 perfume or to choose from the top notch perfumes in Budapest, one of your best choices is in Andrassy Ave. Yes, the amazingly great and expensive perfume shop has a posh beauty salon too (using CellCosmet, Beauty by Clinica Ivo Pitanguy, etc.) 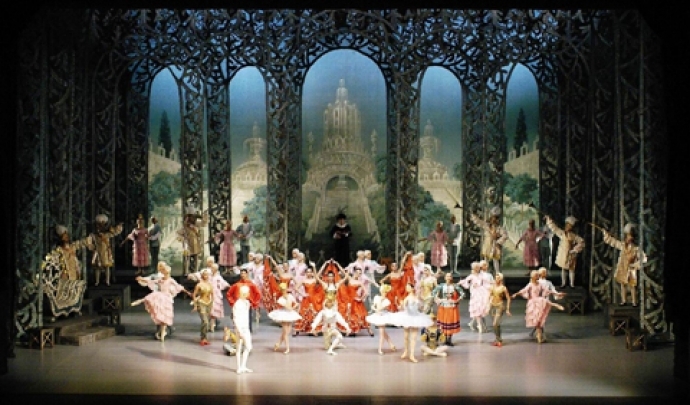 and they also sell special beauty products and other make up necessities for those who love high quality. 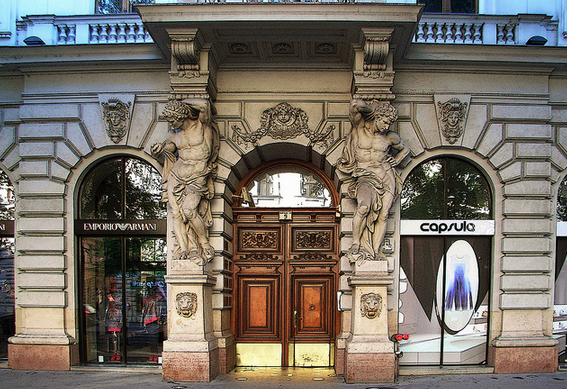 Capsula Luxury Boutique high fashion retailer is also on Andrassy Avenue with brands like Tom Ford, Dolce & Gabbana, Givenchy, Yves Saint Laurent, Giorgio Armani, etc. 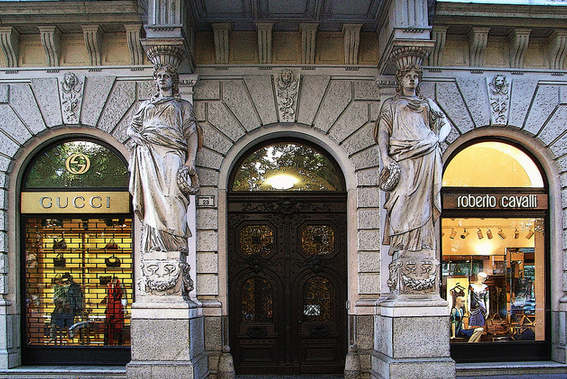 Boggi Milano in Budapest sells its high quality men’s wear, jackets, loafers, bags, shoes, etc. are on the shelves to put you in Italian fashion wear. Max Mara is also one of the luxury boutiques for a five star shopping experience on Andrassy Boulevard in downtown Budapest – dresses, coats, blouses, etc. Basically the only thing that you cannot get from the most important luxury products on Andrassy Avenue is a Michelin starred meal, or tasting menu. See the Michelin star Budapest restaurants here. As mentioned above, Roberto Cavalli in the photo is no longer on Andrassy Way, but you will find loads of luxury stores to satisfy your need for elegance and the feel for the finest touches.